AT LIVE 2 B HEALTHY®, WE’RE UP TO BIG THINGS. Live 2 B Healthy® franchisees are at the forefront of a growing, recession-proof industry – helping today’s seniors remain fit. Owning A Franchise Applying our proven, step-by-step system each franchisee’s income is limited only by their own time and energy. But don’t take our word for it! Read what our franchisees say, learn more about our offering, and then contact us today! You are joining Live 2 B Healthy® at just the right time. We’re growing quickly because now, more than ever, senior citizens need our help maintaining their mobility and strength. 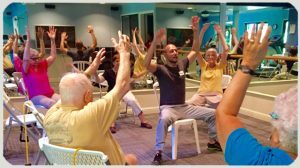 Live 2 B Healthy® offers on-site fitness to senior residents. But more than that, we offer seniors the freedom, independence and dignity that accompanies reclaimed health. And being a Live 2 B Healthy® franchisee is not only personally satisfying; it also makes good business sense. Seniors are not only living longer. They want to live better. With more vitality and enjoyment. What does that mean for you? An emerging market that’s ready for a proven, affordable solution.